Last week, Clarets boss Sean Dyche lamented the level of gamesmanship, cheating - call it what you will - in the Premier League. But after having another penalty claim denied at St Mary’s, he mused, tongue in cheek, whether the time may be right to make his Burnley players masters of the dark arts. However, after he felt George Boyd was felled by Jose Fonte with the game goal-less, only for referee Roger East to give nothing, Dyche felt moved to question his and his side’s honesty. Recently Sam Vokes was criticised on Match of the Day by Ruud Gullit for not going to ground when impeded by Swansea’s Neil Taylor in the box at Turf Moor. And in the midst of much debate in the Premier League over players putting pressure on referees by crowding the men in the middle, the worst example being Chelsea against Paris St Germain, you wonder whether Burnley have been too nice, too sporting, for their own good. You wonder what the game has come to when Burnley, third in the Fair Play League, feel that is almost going against them in a game which has become win at all costs. You could see Dyche’s point but, looking back at this game, the Clarets were their own worst enemy as they again failed to take advantage of their chances, while allowing Saints two soft goals of their own. Burnley, despite having beaten the champions, were up against it against birthday boy Ronald Koeman’s men, who had kept 11 clean sheets, conceding only 12 goals, in their last 19 home Premier League games, and had a league-high 13 shut outs before the game. Fraser Forster has been in goal for all 13 games, but despite being forced off with a freak knee injury after 14 minutes, his replacement, the veteran Kelvin Davis, proved a more than able deputy, in his first outing of the season. The 38-year-old, who played with Dyche at Luton Town in 1999, made three key saves in the first half, twice from Sam Vokes and from Danny Ings. 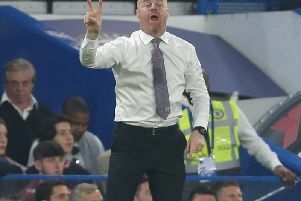 Dyche, however, felt they were saves he would expect his old teammate to make, noting his disappointment in his players’ finishing. After Forster had departed, the Saints had the first opening on 17 minutes when Ryan Bertrand played Graziano Pelle into a great position, but his lack of confidence showed as he passed up the opportunity to shoot and cut back into traffic where Jason Shackell cleared. However, against a very attack-minded Southampton line-up - Koeman essentially sent his players out in a 4-2-2-2 system - Burnley could get at the hosts’ back four rather easily, and Toby Alderweireld had to clear after Ings was unlucky to get the ball stuck under his feet from Ashley Barnes’ threaded pass. Shortly after, Boyd floated the ball out to Barnes on the left, and he hung an inviting cross up for Ings, who found Vokes in space, and he lashed a volley goalwards, with Davis making his first eye-catching stop. From Kieran Trippier’s corner, Boyd’s shot was deflected wide by Pelle. Then came the penalty appeal, as Scott Arfield fed Boyd, and as he cut inside in the box, Fonte slid in recklessly. Did he catch Boyd or part of the ball? It was a tough call, as Boyd took evasive action. You would imagine it was either a booking for a dive or a penalty, but East gave neither. Burnley were on top, but seven minutes from the break, Nathaniel Clyne’s speculative shot ricocheted off Barnes, was missed by Pelle, and Shane Long gobbled up the chance from close range to hand the Saints the lead. Shortly after Pelle somehow hit the bar from four yards then as Burnley broke, Trippier’s cross found Ings, and his shot, curling towards the corner, was brilliant stopped by Davis. In injury time, Tom Heaton was called on to palm over Stephen Davis’s header from a Tadic cross, but there was still time for more heroics from Saints’ substitute keeper, bearing away a header from Vokes after Barnes headed back a Trippier centre. At half-time, Koeman, in a compliment to Burnley, recognised his side were too open, and replaced Tadic with Victor Wanyama, reverting to more of a 4-5-1, and the big Kenyan’s physical prowess helped shut the game down for the hosts. They started to get more control of the game, as Davis shot into the side netting, before Long cut across a terrific volley which flew just wide. Just before the hour, Davis lifted a pass for Bertrand to cross from the bye-line, and his delivery flew in off Shackell’s knee. You sensed that was game over, and Burnley struggled to find a way back into it. Boyd had a shot deflected wide after Trippier’s clipped pass, but Saints looked the more likely to score, though Pelle continued his struggles in front of goal. First he headed a Davis cross at Heaton, before, late on, somehow fluffing a header from a Long cross, when positioned right in front of goal. It mattered not. Southampton’s charge for the top six continued, while Burnley remained pretty much as they were as results fell for them.